I had a miserable day yesterday, so I was really hoping that Bountiful Baskets this morning would be worthwhile. I needed a pick-me-up. So I set the alarm for 4:45... and woke up at 4:25 instead. Decided to get up and get going. I have been doing Bountiful Baskets every other week since the second weekend in June... and I have never managed to volunteer before. I just couldn't bring myself to drag my teen/tween boys out of bed that early. So, since they did not have to come with me today -- they are at a cooking campout for Scouts -- this was the day. Anyway, this time, I only got 1 regular basket. But I also got a 25# box of Roma tomatoes, and TWO of the new fruit boxes. Wow, wow, wow. I took different pictures this time. Because I had people asking me about the containers I haul this stuff home in. Back in June, I saw these "bags" at Walmart, and just had to have them. I use one for veggies and one for fruit. Love 'em. Didn't take a picture of my gorgeous big box of Romas. I'm hoping there are enough cucumbers to do up some pickles. Otherwise, I need to decide what to do with those. Onions will go with the others we have around. Those always get used. I bought some tomatillos and will be doing up some salsa verde. Loved this last time. broccoli will either be eaten with dinners, or I might get some frozen. This recipe looks interesting. Tomatoes are turning into spaghetti sauce (along with the onions, most likely), maybe some salsa, and we'll see what else. Figs... this cookie recipe was posted on the Bountiful Baskets Facebook page. I'll freeze at least one of the bags of grapes. And the kids will be eating fruit. I need to figure out something to do with the yams, and I probably need to do something with at least some of the fruit. Debra - you can cook the yams -sweet potatoes in my state :) and freeze them. Then all you have to do is warm them in the microwave. to serve - remove from bag as many as you need, heat and serve mashed or whole. We eat ours with butter or with chicken pastry (dumplings). Now I need to find out about bountiful baskets! Yummy yummy yummy! I have a recipe for "cucumber salad". It's kind of sort of a little bit like refrigerator pickles except they aren't pickles. They are not condiments but can be eaten as a salad. It would use some of the onions. And speaking of onions if they are REALLY big they might be sweet onions (think Walla Walla or the V one I can't remember. Those would be *excellent* with the cucumbers or made into onion petals/blossom/ring things. 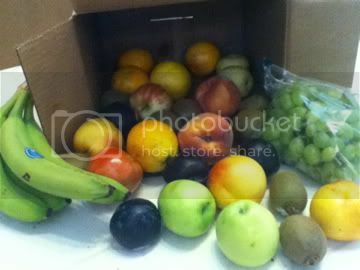 If/When I post about Bountiful Baskets I'm linking to your blog :) I wish I could get a fruit box! so do you blanch your cauliflower before you freeze it? I froze mine without blanching that last night, but I think I will use it this week. I'm just trying to decide if I should pull it out and blanch it. Oh, I meant to suggest you go to food.com and search on refrigerator cucumber pickles. You will get quite a few to choose from... I like their recipes. The ones I've used so far have done quite well. I'm not sure if my first comment went through so I will repeat what I recall. The 'V' onion is the Vidalia. There is also a sweet onion from Mexico, but I don't know what the variety is called. 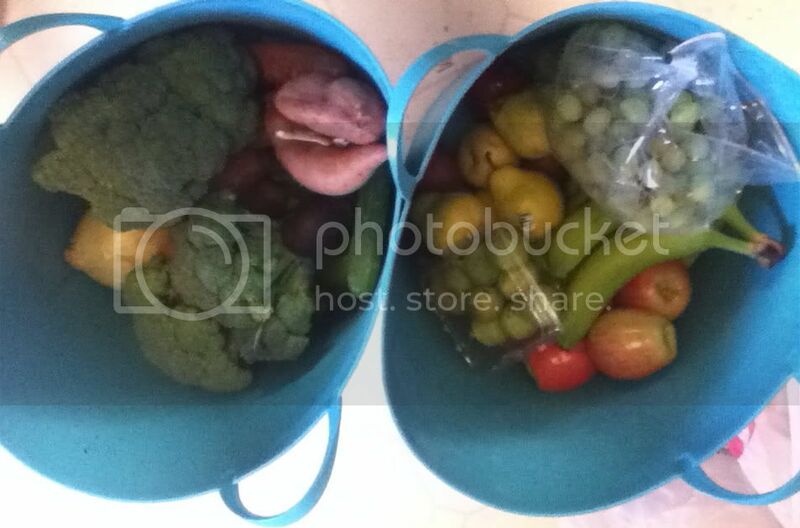 As for freezing vegetables you need to blanch them before freezing. Otherwise they will be rubbery when you cook them later. I'm getting my first Bountiful Basket this weekend and I can hardly wait! My cousins get them in Boise, ID, and have been raving about them in facebook so I had to find out if we have them here too, and the pick up spot is really close to my house! How much better can you get? I ran acorss this site on the Bountiful Baskets link on Facebook. Thanks for the tip on the sweet potatoes. The "V" onion Tess was mentioning is Vidalia. Sometimes the little sticker like you see on produce at the store is on the produce from BB. I'm also anxious to hear about whether the cauliflower should be blanched. Thanks, all! Throw the yams in a pan with water, boil until soft. Let them cool, the skin will come right off. Mash them with potato masher or in a food processor......you can use them just like pumpkin; no one will know the difference! i can't believe I was on the Bountiful Baskets facebook page! Cauliflower... I blanched them before freezing. I felt more comfortable about it that way. The onions are definitely plain everyday yellow onions... just big ones. Wow, those fruit boxes look great! Glad to have found your site Debra. I'll add you to the other Bountiful Baskets blogs! I used the sweet potatoes/yams tonight with pork tenderloin, apples, and onions for a tasty one pot dinner. Using a covered stoneware roaster, I coated the bottom with a bit of olive oil, then threw in cubes of sweet potato, some chopped up onion, the pork tenderloin, and then sliced apples. I seasoned with cinammon, ginger, salt, pepper, a dash of cayenne pepper, a shake of molly mcbutter, and a couple of tablespoons of brown sugar splenda. Popped it in the microwave and cooked on high for about 20 minutes. So easy and yummy!